A holistic understanding of modern evolutionary biology suggests that life evolves by a process of diversification and subsequent integration of diversity through collaboration (John Stewart in BioSystems, 2014). As our focus shifts from individuals and individual species as the unit of survival to the collective of life — its complex dynamic interactions and relationships — we begin to see that collaborative and symbiotic patterns and interactions are of more fundamental importance than competition as a driving force of evolution. Life’s key strategy to create conditions conducive to life is to optimize the system as a whole rather than maximizes only some parameters of the system for a few at the detriment of many (Wahl, 2016). The patterns of evolution show a general trend of diversification and subsequent or parallel integration at a higher level of systemic complexity. This integration tends to happen predominantly through the creation of more complex organismic or social entities, primarily by collaboration and symbiosis. John Stewart suggests that this is moving us towards a ‘global entity’ (2014). Maybe this entity already exists in the life-sustaining processes of the biosphere? The biologist Peter Corning, former president of the International Society for Systems Science and director of the Institute for the Study of Complex Systems, suggests that “one aspect of this more complex view of evolution is that both competition and cooperation may coexist at different levels of organization, or in different aspects related to the survival enterprise. There may be a delicately balanced interplay between these supposedly polar relationships” (Corning, 2005; p.38). He emphasizes that collaboration has been a key factor in the evolution of our own species. The socio-economic payoffs of collaboration in response to ecological pressures and opportunities among early humans have shaped the evolution of languages and cultures, both require and enable complex patterns of collaboration. If we want to re-design economics based on what we know about life’s strategy to create conditions conducive to life, we need to question some basic assumptions upon which the narrative underlying our current economic systems is built. The narrative of separation has predisposed us to focus on scarcity, competition, and the short-term maximization of individual benefit as the basis on which to create an economic system. Life’s evolutionary story shows that systemic abundance can be unlocked through collaboratively structured symbiotic networks that optimize the whole system so human communities and the rest of life can thrive. We are not the masters of life’s diversity, and have the potential to become a regenerative presence in ecosystems and the biosphere. Our re-design of economic systems has to incentivise both collaborative and competitive processes if and when appropriate. Both collaboration and competition contribute to how life creates conditions conducive to life. The biologist Andreas Weber explains: “The biosphere is not cooperative in a simple, straight-forward way, but paradoxically cooperative. Symbiotic relationships emerge out of antagonistic, incompatible processes” (Weber, 2013: 32). Weber stresses that we have to understand how the works of the economist Adam Smith and the political economist Robert Malthus influenced Charles Darwin in his attempt to construct a theory of evolution. 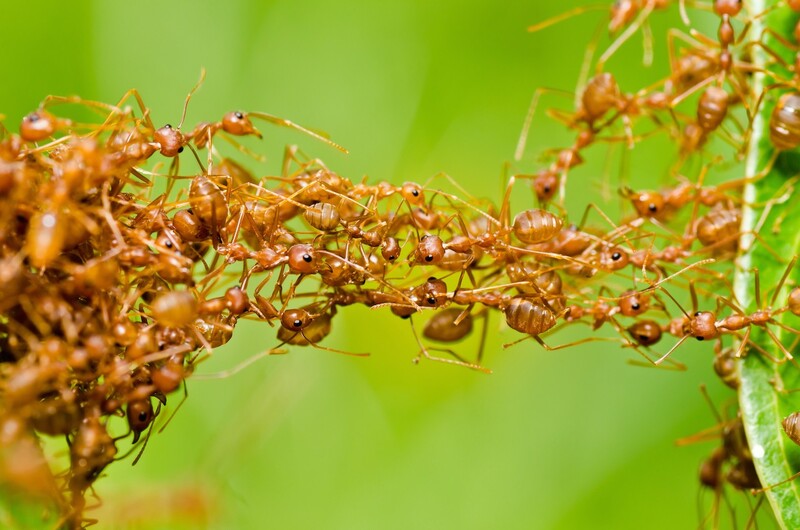 Example of collaboration in leaf-cutter ants. The limited narrative of separation, with its exclusively competition- and scarcity-focused understanding of life, is supported by outdated biological and economic theories. Weber calls this an “economic ideology of nature” and suggests that an ideologically biased perspective “reigns supreme over our understanding of human culture and world. It defines our embodied dimension (Homo sapiens as a gene-governed survival machine) as well as our social identity (Homo economicus as an egoistic maximizer of utility). 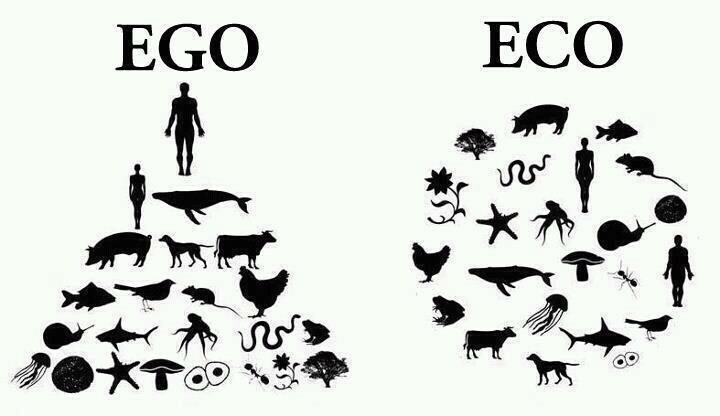 The idea of universal competition unifies the two realms, the natural and the socio-economic. It validates the notion of rivalry and predatory self-interest as inexorable facts of life” (pp.25–26). The optimization of resource-sharing and processing in order to (re)generate and share abundance and systemic health, rather than competition for scarce resources, is the basis of life’s way of doing economics! In attempting to create a life-friendly economy, we need to understand the profound implications that the emerging ‘systems view of life’ has for our undertaking. Here is a 7min video of Fritjof Capra presenting the book with explicit reference to economics. The evolutionary biologist and futurist Elisabet Sathouris describes how in the evolution of complex communities of diverse organisms a ‘maturation point’ is reached when the system realizes that “it is cheaper to feed your ‘enemies’ than to kill them” (personal comment). Having successfully populated six continents and diversified into the mosaic of value systems, worldviews, identities (national, cultural, ethnic, professional, political, etc.) and ways of living that make up humanity, we are now challenged to integrate this precious diversity into a globally and locally collaborative civilization acting wisely to create conditions conducive to life. The challenge of a fundamental re-design of how we do business, of our patterns of production and consumption, of the types of resources and energy we use, goes hand in hand with the structural redesign of our economic systems. We have to challenge economic orthodoxies and basic assumptions, and find ways to integrate multiple perspectives if we hope to redesign economies at multiple scales and learn how to manage our household with wisdom (oikos + sophia). If our Homo sapiens sapiens wants to continue its fascinating yet so far relatively short evolutionary success story we have to evolve wise societies characterized by empathy, solidarity and collaboration. Wise cultures are regenerative and protect bio-cultural diversity as a source of wealth and resilience (Wahl, 2016). The rules of our current economic and monetary system have been designed by people and we can therefore re-design them. We have to question the role of scarcity, competition, and the maximization of individual benefit has cornerstones of our competitive economy. In redesigning economic systems at local, regional and global scale we should pay special attention to how the system incentivises regenerative practices, increases bio-productivity sustainably, restores healthy ecosystem functioning, while nurturing thriving communities. Modern evolutionary biology transcends and includes Darwinian justifications of competition as ‘human nature’, as it acknowledges that complex patterns of collaboration have enabled the evolution of our species and the continued evolution of consciousness towards planetary awareness. Our ability to cooperate has shaped who we are in equal and possibly more profound ways than competitive behaviour, hence we need to re-design economic systems to establish a healthy balance between the way competition and collaboration are incentivised in the system. Rather than maximizing isolated parameters or the benefit of a select few, a re-design of our economic system to serve all of humanity and all life will have to optimize the health and resilience of the system as a whole (understanding humanity as nature; and the economy as a sub-system of society and nature in interconnected eco-social systems). The dominant narrative of separation creates a focus on scarcity, competition and individual advantage, while the emerging narrative of interbeing challenges us to create a win-win-win economy based on the understanding that it is in our enlightened self-interest to unlock shared abundances through collaboration.